Researchers from City, University of London have launched Drug Recovery game™, a new board game designed to help frontline health, social and community care staff understand the realities of drug recovery. Staff working with people who have an addiction aren’t always addiction specialists. They may not have a full understanding of the nature of the recovery process, or the ups and downs a person might go through in everyday life. The Drug Recovery game™, which is produced by Focus Games, helps them to understand that recovery can be long and difficult path, rather than a smooth straight road. By understanding the ups and downs of the recovery process, frontline staff will be better equipped to work effectively with people who are in the process of giving up drugs or alcohol. With the help and guidance of the Research and Enterprise Directorate, an intellectual property license was granted to Focus Games Ltd. Academic Enterprise further provided proof of concept funding to support the project. Originally created by Lorna Saunder, Lecturer in Mental Health at City, University of London, the Drug Recovery game™ is designed to provide an overview of the journey that a person takes when trying to give up any substance. In the game, players compete to reach the top of “Recovery Mountain”, answering and discussing questions to improve their drug and alcohol knowledge. Their journey to achieve recovery is helped or hindered by “Recovery” and “Trigger” cards that present situations that can trigger a relapse, or lead to a positive change in behaviour. The game is suitable for anyone in health, social and community care who has contact with individuals recovering from addiction. It is suitable for qualified staff and students. It takes just 30 minutes to play and is an engaging and memorable way of exploring the drug recovery journey. 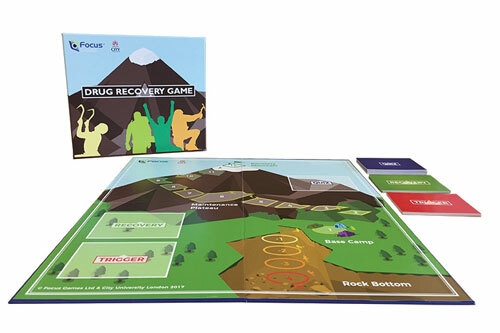 The Drug Recovery game™ is published by educational games specialists Focus Games Ltd, and is available for purchase through their website at www.focusgames.com.